NASA's Chandra X-ray Observatory solves the mystery of x-rays from comets by peering into the core of the surprising Comet LINEAR. August 23, 2000 -- When NASA launched the Chandra x-ray telescope in July 1999, scientists were eager for a look at the most violent and fiery denizens of the Universe. Chandra's sensitive instruments record x-rays produced when matter is heated to millions of degrees by collisions in extreme gravity or by violent explosive forces. Supernova explosions, black holes and colliding galaxies are standard fare for the Great Observatory. Normally, to be included on Chandra's highly competitive observing schedule, a celestial object needs to be hot -- really hot. But scientists made an exception last month when they turned the telescope toward Comet LINEAR, an icy ball of dust grains and frozen gas from the outer solar system. Above: The frigid nuclei of comets are made of rock and dust held together by frozen gases colder than -70 C. Even mild solar heating can cause the icy core to vaporize. Comets hardly seem to be a good prospect for x-ray astronomers. Image Credit: Windows to the Universe. Comet LINEAR is well-known mainly because it "exploded" when it passed by the Sun in July 2000, but the event was not akin to a stellar flare or a supernova explosion. It simply crumbled into a swarm of chilly "cometesimals" as sunlight vaporized frozen gases that held the comet's lumpy nucleus together. Comet LINEAR's explosion was not a violent x-ray producing event. Nevertheless, Chandra images of Comet LINEAR revealed an x-ray glow surrounding the Sun-facing side of its nucleus. The cold nucleus itself was invisible at x-ray wavelengths, but the gas around it was alive with variable x-ray emission. In 1996, Hyakutake dazzled observers across the globe as it passed less than 16 million km from Earth. Sunlight reflecting from its 500-million kilometer tail made it one of the brightest comets of the 20th century. No one expected Hyakutake to be a powerful x-ray source, but theorists at the time speculated that dusty gas surrounding the rapidly vaporizing core might scatter a small number of high-energy photons from the Sun, producing a faint x-ray halo. Astronomers using ROSAT decided to look at Hyakutake and they were shocked by what they saw. ROSAT images revealed a crescent-shaped region of x-ray emission around the comet 1000 times more intense than anyone had predicted! "It was a thrilling moment when the X-rays from the comet appeared on our screen at the ROSAT ground station," wrote Dr. Konrad Dennerl of the Max Planck Institute for Extraterrestrial Physics, a member of the ROSAT imaging team in 1996. "We had no clear expectation that comets [would] shine in X-rays," wrote another member of the team, Dr. Michael J. Mumma of NASA's Goddard Space Flight Center, four years ago. "Now we have our work cut out for us explaining these data, but that's the kind of problem you love to have." Left: The wavelength of radiation produced by an object is usually related to its temperature. The human body is warm enough (about 30 degrees Celsius) to generate infrared radiation, but it takes very high temperatures (millions of degrees Celsius) to produce X-rays. So, how could x-rays come from a frigid comet? Note: degrees Kelvin (K) = degrees Celsius (C) + 273. Credit: Harvard's Field Guide to X-ray Astronomy. That problem -- the enigma of intense x-rays from comets -- would persist for four more years. During the interim, the ROSAT, EUVE and BeppoSAX satellites detected x-rays and extreme ultraviolet radiation from more than half-a-dozen comets including Comet Hale-Bopp. But it was not until last month when Chandra observed Comet LINEAR that the answer finally emerged. One of Chandra's instruments, its Advanced CCD Imaging Spectrometer (ACIS), is able to pinpoint x-ray emission from particular types of atoms. ACIS observations of Comet LINEAR revealed a strong x-ray signal from oxygen and nitrogen atoms that had lost most of their electrons, such as O6+. It's easy to remove one or two electrons from an atom like oxygen, but stripping away six electrons is hard to do. It can only happen in a high-energy environment where violent collisions or strong radiation disrupt the atom. Strongly charged ions are not produced by the relatively gentle vaporization of cometary ices, but they are common near the core of the Sun and in the Sun's super-heated outer atmosphere, the corona. Scientists believe that the ions detected by Chandra around Comet LINEAR were carried there from the Sun's corona by fast-moving solar winds. The solar wind, which buffets Earth's magnetosphere (sometimes triggering spectacular aurora) and pushes against gaseous comet tails, is really a part of the Sun's corona. At one million degrees C, the corona is so hot that gravity can't hold it down. 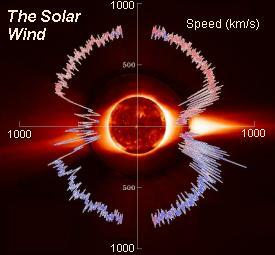 Its upper fringes flow away from the Sun in all directions at 400 to 800 km/s. Positively charged ions like O6+ make up about one percent of this solar wind. When ions from the Sun blow past a comet, their strong positive charge attracts negatively-charged electrons from cometary atoms and molecules. In effect, the ions try to neutralize their own unbalanced charge by stealing electrons from the comet. Electrons that leap from neutral atoms to the passing solar wind ions emit x-rays as they cascade from high-energy to low-energy ionic orbits. This process, called a "charge exchange reaction," was first proposed in 1997 as a possible reason for cometary x-rays [ref]. A telltale sign of charge exchange is x-rays emitted at wavelengths that are specific to the internal energy levels of the ions. That's exactly what Chandra's ACIS instrument detected in the x-rays from Comet LINEAR -- spectral lines from oxygen and nitrogen ions present in the solar wind. Above: Soon after astronomers discovered x-rays coming from comet Hyakutake, a team of scientists at the University of Michigan suggested charge exchange reactions between the solar wind and cometary gases as a possible explanation. They predicted some of the x-ray spectral lines that charge exchange should produce (pictured above), including highly ionized Oxygen, Carbon, and Neon. but it was impossible to fully test their theory until last month when Chandra looked at Comet LINEAR with its high-resolution x-ray spectrometer. [more information]. "This observation solves one mystery. It proves how comets produce X-rays," said Dr. Carey Lisse of the Space Telescope Science Institute in a recent press release. "With an instrument like Chandra, we can now study the chemistry of the solar wind, and observe the x-ray glow from the atmospheres of comets as well as planets such as Venus. It may even be possible to observe other, nearby solar systems." Who would have thought you could learn so much by looking at a piece of ice with an x-ray telescope? Comets are clearly hot stuff! Stay tuned to Science@NASA for more news about the strange odyssey of Comet LINEAR. X-ray Star Stuff - Astronomers using the Chandra X-ray Observatory are seeing how supernovae spray the essential elements of life into interstellar space. The Andromeda Drain - The Chandra X-ray Observatory has spied a peculiar black hole at the center of the Andromeda galaxy. Black Hole Hide and Seek -- Astronomers have found a galaxy that looks normal in optical light, but Chandra's x-ray vision reveals a black hole in the middle. A Brown Dwarf Solar Flare -- Astronomers were surprised when NASA's Chandra X-ray Observatory detected an x-ray outburst from a failed star only 60 times more massive than Jupiter. One small step for Chandra......one giant leap for X-ray astronomy --NASA's newest Great Observatory solves a longstanding mystery. A New Cosmic Meter Stick -- X-rays scattered by interstellar dust grains have led scientists to develop a new way of estimating distances to cosmic objects using data from NASA's Chandra X-ray Observatory. Galaxies in Collision -- The Chandra X-ray Observatory has captured pictures of a colossal cosmic "weather system" produced by the collision of two giant clusters of galaxies. Cosmic Bar Codes --The Chandra X-ray Observatory has peered into the nucleus of a distant galaxy and detected warm gas flowing away from a black hole. Chandra Peers into the Large Magellanic Cloud -- The X-ray Observatory's High Resolution Camera catches extraordinary pictures of a distant supernova remnant. Chandra goes prospecting inside a supernova -- Data from NASA's Chandra X-ray Observatory offer a new understanding of stellar explosions.